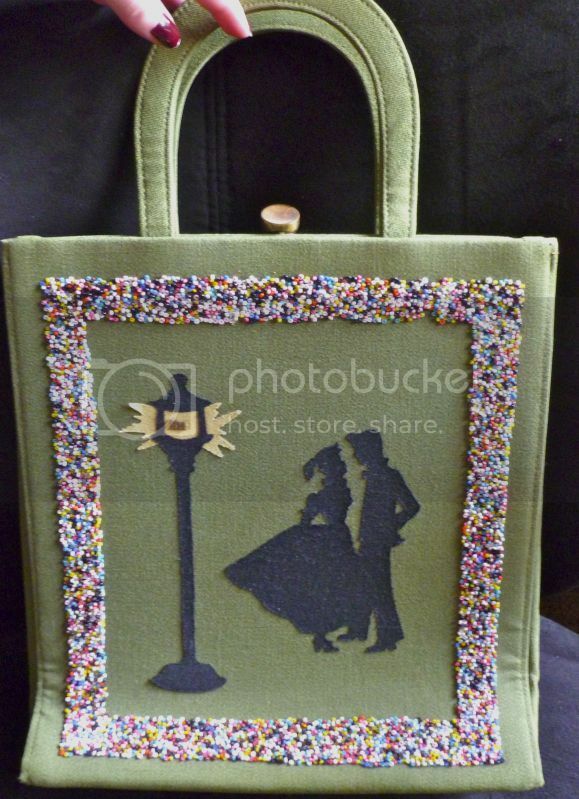 Vibrant Green Purse with Beadwork and Silhouette Couple. 1950s/60s. Maker: Martin. A rich green—cross between lime and olive—tote-style handbag with a metal closure and half-oval fabric handles. It features a fun design of a ‘50s couple—she in full skirt and ponytail, he in collared shirt and ducktail hairdo—in silhouette, flirting under an old-fashioned streetlight. It’s got glued-on multicolored seed beads framing the cloth appliqued design. Lined in black fabric, with an inner zip pocket and another non-zip pocket, it is gold-stamped with the manufacturer name “Martin.” It looks as if it’s never been used. Often, I’ll see online sellers saying their vintage bags are “one-of-a-kind” or “unique,” even though, as a longtime collector, I’ve run across them numerous times. This one, however, is a purse I’ve never seen before. I don’t know if someone bought a plain bag and custom-appliqued it, or if it came from the manufacturer like this. Also, I’ve never heard of the manufacturer, so if you know anything about Martin, please e-mail me at info(at)wendydager(dot)com. Now, the coolest part… it set me back five bucks. Yep, there are still deals to be had—you just have to look for ‘em!